Two attorneys general may be faring better than lawmakers, nonprofit organizations and restaurant owners have in taking President Trump to court over the continuing profits his company makes from its lease of the government-owned historic building in Washington that houses the Trump International Hotel. On Wednesday, a district court judge rejected Trump’s attorneys’ request for a dismissal of a lawsuit brought by Maryland Attorney General Brian Frosh and District of Columbia Attorney General Karl Racine. That allows the case to go on to decide whether Trump violated the Constitution’s Emoluments Clauses, which prohibit a president from accepting gifts from foreign governments or federal, state or local representatives while in office. U.S. District Judge Peter Messitte of Maryland in a 52-page ruling reported by Bloomberg said, “a number of foreign governments” have “patronized or have expressed a definite intention to patronize the hotel, some of which have indicated that they are doing so precisely because of the president’s association with it." He added that Maine Governor Paul LePage "and his entourage” also stayed there. 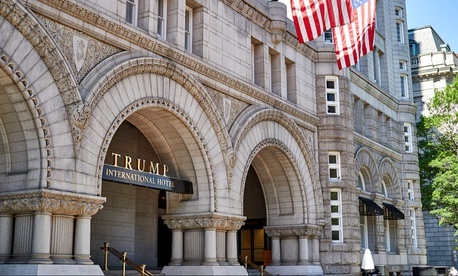 Local restaurant owners competing with the Trump hotel’s hospitality offerings have previously filed similar suits, as have Democratic lawmakers and the nonprofit organization Citizens for Responsibility and Ethics in Washington. Trump critics have argued that his 2012 lease on the hotel with the General Services Administration posed a conflict of interest once he became president. But the case brought by the attorneys general is also being fought out over the meaning of the Emoluments Clauses. The Trump lawyers argued, as they have in previous cases, that the plaintiffs lacked standing to sue. The judge, citing Georgetown University law professor John Mikhail’s research, wrote that "the decisive weight of historical evidence supports the conclusion that the common understanding of the term 'emolument' during the founding era was that it covered any profit, gain, or advantage, including profits from private transactions. Consideration of the purpose of both Emoluments Clauses confirms the broad interpretation of the term suggested by plaintiffs." Steven Schooner, a George Washington University law professor and veteran of the Office of Management and Budget—who has been active on behalf of those who have filed in the lawsuits—told Government Executive that the judge’s ruling on the definition of an emolument “is unsurprising. What makes this case unique is that it got this far—and that only happened because this case was brought by the [governments] of D.C and Maryland.” Private citizens and interest groups “do not appear to enjoy rights to enforce the constitutional prohibition in court,” he said.